Let your veterinary practice management software do the work. Practice managers and owners should spend a large portion of their time looking at how to keep and achieve better financial records for the practice. It is difficult to ensure records are accurate and taking a deeper look into what is performing well is a daunting process. 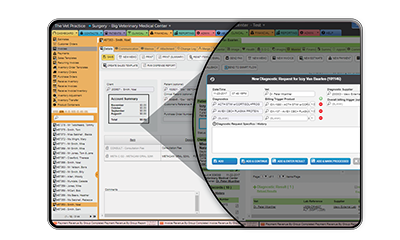 The right veterinary practice management (VPM) tool will let you do better at your job. If you would like to automate processes and analyze your financial information for better returns, look to your VPM system to help you with this. Veterinary inventory management is frustrating and time-consuming. ezyVet's inventory management tools will fast-track these processes for you. Configure your products for batch, serial and expiry tracking. Integrated suppliers to place orders, check prices, receive invoices, automatically receive price updates and more. Capture charges as you go with ezyVet’s automated billing system. If an appointment is created or lab test is requested, the fee is going to automatically transfer to the invoice. Simple logic, and all charges captured! Streamline your reception by taking payment right out of ezyVet. Integrated payment provider PayJunction offers users the ability to operate in a completely paperless environment. Record keeping has never been easier! "With PayJunction, you have the ability to integrate digital signature capture and take your practice fully paperless. 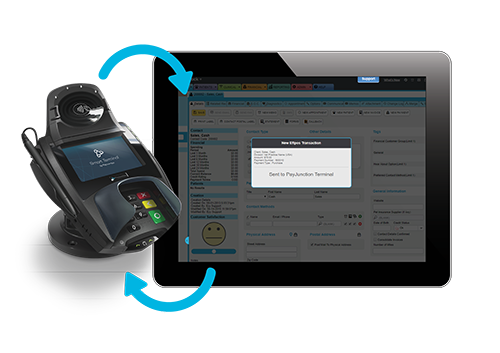 Furthermore, integrating credit card payments eliminates duplicate entry and transposition errors, improving the efficiency of your practice — especially when running your end-of-day close. PayJunction helps our mutual customers check batches, easily reconcile deposits and see cumulative sales totals with ease. This is especially important when you manage multiple practices as it allows you to merge data to see sales totals overall." — Cole Valadez, Integration Sales Manager at PayJunction. ezyVet comes equipped with over 70 great inbuilt reports. 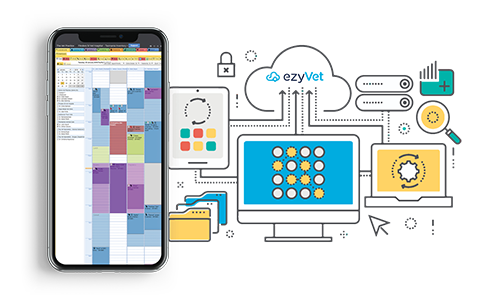 These reports will help you, as a practice manager, to identify and analyze data, and to operate as efficiently as possible, ensuring that you are always aware of what is going on in your practice. 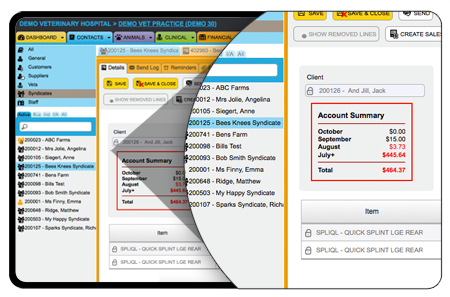 ezyVet has a two-way integration with XERO, a simple and efficient accounting platform, ideal for vet clinics. Reduce double-handling when issuing invoices, receiving money or entering supplier’s invoices. Consumers want the option to pay at their own convenience online. Not only does it reduce administration from your team, but also allows customers to keep better financial records themselves. With ezyVet's online portal, customers can pay individual or all outstanding invoices using PayPal. Ensure invoices are paid on time by using SMS to send invoice reminders with a link directly to the portal. Pets commonly have two or more owners who wish to share the costs of taking care of their furry friends. ezyVet has a super easy syndicated billing feature which gives management the power to break down billing to each syndicate member for their share. Every company has their own unique business requirements. ezyVet's multi-location function makes linking practices, overseeing business operations and separating financial records easy. We are excited to announce our new commission feature for reporting. The module allows you to set up user-based commissions for product groups and individual products. Just set up commission rates and use ezyVet's inbuilt reporting to formulate exactly how much commission is due. These features are some of the many tools that ezyVet users benefit from for better vet practice management. 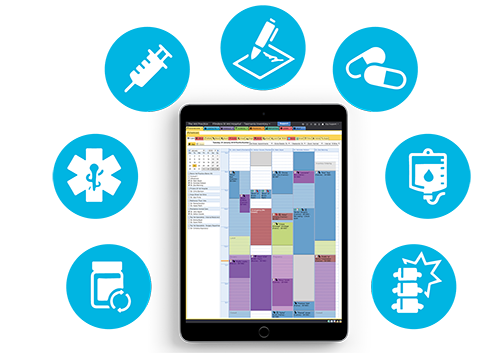 If you are looking for VPM tool that helps you be better at your job, consider ezyVet cloud vet software.